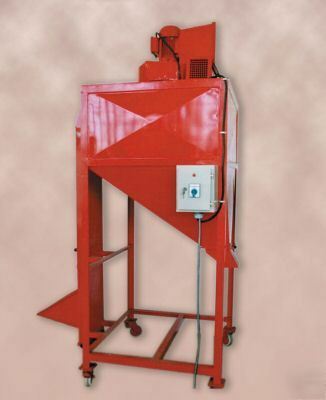 A destoner is a machine that separates metal and stone debris from coffee beans without harming the your beans. This is accomplished using air and the difference in density. Destoners are very easy to use and require minimum maintenance and is very efficient. The destoner is on wheels making it easier to store when not in use. In addition to coffee - destoners are good for processing of: Spices (black or red pepper, cumin, thyme, mint) plus corn, rice, rye, wheat, barley, oat, pepper, hazelnut, almonds, cacao, dried fruit, dried vegetables, etc. Comes with a one year owner servicing warranty. I’m not just another re-seller - I am a coffee roaster. Warranty - one year warranty and are owner serviced. Stock - Standard lead time is 8-12 weeks from deposit and completed option choices. Please check for inventory status before ordering for current lead time.